This is a guy people used to stack against. However, the Rockies are hitting very poorly to open the year. Even worse they are against LHP, sporting just a .206 AVG. If this was in Coors, no chance in you know where am I playing Pomeranz. But, since he gets pitcher friendly AT&T Park… I can get behind using him here. Blackmon, Arenado and Wolters are the only Rockies with a K-rate of less than 20%. Now, Pomeranz isn’t a strikeout pitcher and I don’t see him winning you GPPs, but the savings you can use by going to him can help you get those bats you will need to take them down. Pomeranz is 2-0 with a 1.50 ERA in two starts over the last 3 seasons v. COL.
Wheeler had a good spring. I thought things might be turning around for him but I was dead wrong. 4 runs to the Nats in game one. 7 runs the next outing. Wheeler is a gas can to keep stacking against. The Braves boast a .344 AVG in 80 PA against him. 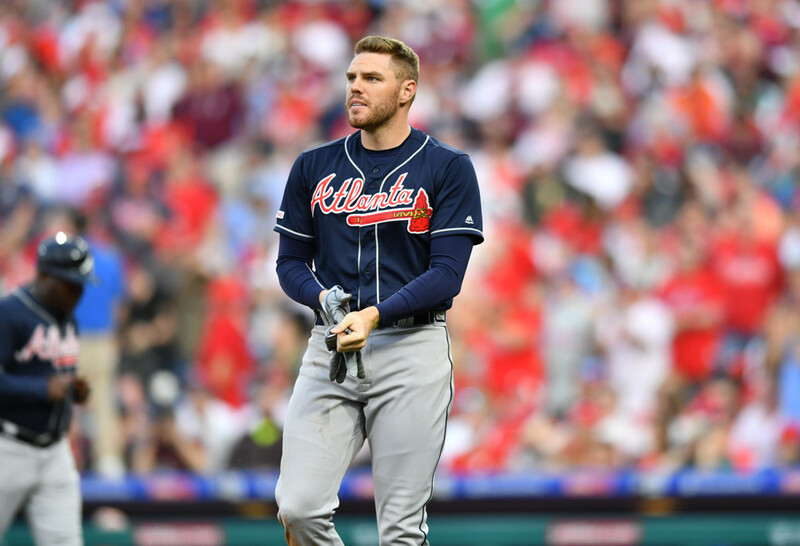 Freddie Freeman will be a cash play lock for me tonight. He MASHES Wheeler with a .526 AVG and 2 HRs in 30 PA. He has been walked 10 times by Wheeler. If that wasn’t enough, he hits .345 against the Mets last 3 years and .310 v. RHP last 3 years. I am not even looking at another 1B in cash games tonight. Might be 100% owned by me. Let’s head to the most pitcher-friendly confines at Oracle Park for a sleeper bat. Brandon Belt has hit well against Colorado over the last 3 seasons to the tune of a .302 BA and .890 OPS with 7 homers. Three of those homers were slugged at home in San Fran. Belt will be staring down Rockies’ starter Chad Bettis, who he’s hit .360 against in 25 ABs with a .989 OPS and a dinger. Bettis is a low strikeout pitcher who had below average HR/9 (1.35) and and HR/FB (15.1%) in 2018 and was tagged for 2 HR in his start this season in another pitcher-friendly Park at Tampa. Belt has 3 home runs so far this month and will be looking for more on Friday. Why would we even consider using any lefty against the Orioles at this point. They’re not a rockstar offense, but they’re not scrubs either (better than league average against LHP). ERod is far too expensive considering how poorly he’s been playing so far this season. He has given up 12 ER in only 8 IP so far, striking out just 7 batters in that time. Even though Fanball doesn’t count ER against a pitcher, a combined 8IP/7K over two games isn’t going to cut it. I’d much rather use a guy like Drew Pomeranz and stack against Rodriguez rather than paying up.